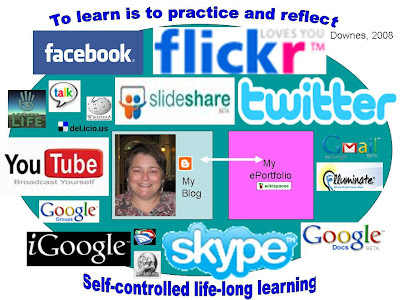 Last May I wrote a blog post about my personal learning environment (PLE), and in it I wrote about the various online tools I used for my learning and reflection, communication and collaboration. 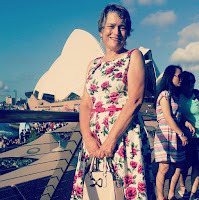 In the comments, Claire Thompson suggested I carry out a similar reflection to see how my PLE has evolved over a period of time - so here is my reflection a year later. To remind you, here is what my PLE looked like last year. And here is my PLE one year later. The main change is that there is a reduction in the number of tools that I use, with a greater reliance on a favored few. 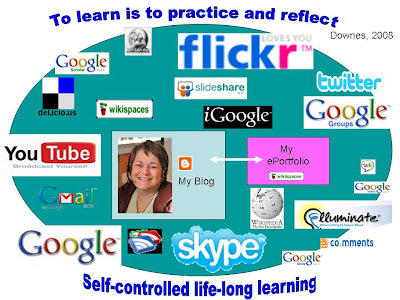 My blog and ePortfolio remain at the hub of my PLE, but I feel there is now an equality of importance between the two activities, as opposed to last year when my blog was the most important tool in my PLE. Unfortunately, I do not have the time to blog in the same way I did this time last year. At the same time, because my employment status has changed and I will be looking for a new job at the end of June, I am conscious of the importance of keeping my ePortfolio up to date so I can use it as a means of attracting the attention of potential employers. I rely more on sites like YouTube and SlideShare for obtaining information, and less on Wikipedia and RSS (Google Reader). I am doing more publishing on YouTube, SlideShare and Flickr, and noticing an increase in conversations on these sites as a result. My use of Delicious has dropped (maybe because I am not currently using it as a teaching tool for students), although I still use it regularly as an ePortfolio tool. I am hardly using Google Reader - I just don't have the time to spend reading many other blogs, I am afraid. But my use of Google Documents has increased substantially as I get more involved with collaborative work at a distance. Twitter and Skype figure hugely as communication tools especially since I moved to Australia. I haven't had the time to do much blogging, and have found that using Twitter has allowed me to keep in touch with people in between blog posts. I also had huge problems accessing the Internet when I first moved to Australia, and Twitter was about the only tool I could use for synchronous communication. Second Life has made an appearance, and I am starting to make connections with people as a result of Second Life. This isn't so much because we have met in Second Life, but rather because the development work we are doing there is a point of commonality. It will be interesting to see if Second Life becomes an important part of my PLE once my involvement in the SLENZ research project is completed in November/December. And finally, much to my horror, Facebook has become a reasonably influential part of my PLE. I say 'horror' because I strongly dislike FaceBook as a frivolous waste of time. But....I have been making a steady number of professional connections there, and joining groups which I am using for finding and disseminating information. I feel like I have been dragged into FaceBook kicking and screaming, but I also feel I ignore it at my peril. How is your PLE looking these days? How has it changed in the last year? What are your favorite tools now, and why? I feel compelled to leave a comment aftewr reading another blog post about why we don`t leave comments and another one which says blogs without comments are sad! I feel the same about Facebook having recently removed my account i found it difficult to get around and unclear but it is always in the back of my mind. I`m nowhere near being at the end of my first year of building a PLE but I look forward to doing the same thing. I don't like the new layout for FaceBook, and hate all then distractions, but so many people I know are on it (including people who use no other online tools) I'd be shooting myself in the foot if I ignored it. Thanks for that, Pam. Hi Sarah, happy Easter! I did a similar post in January, Tools and Sites I Use--One Year Later, and it is interesting to compare your annual review with mine. Unlike you, my list of tools grew. Perhaps the difference is that a year ago I was very new to web 2.0 and went through an intense discovery and exploration phase--perhaps you'd been exploring longer? I've noticed that lately I will hear about a new (to me at least) application and I'll give it a quick look, but if I feel my needs are already being met in that area I won't do much more than look. It's interesting that your use of Google Reader is down. I too am finding it a bit of a burden to keep up with all of the great blogs to which I've subscribed. Part of this for me is because of Twitter; I'm spending more time following links from there that come recommended. I've enjoyed reading your reflections. All the best! Thanks Claire for dropping by-hope you have a great Easter also. There are other tools I use but haven't included them into my PLE because I may not use them very often, such as Wordle, Animoto & Jing. They are great tools but I do not use them on a daily basis like I do tools like Twitter. Like you, Twitter is now doing a lot of the work that Google Reader used to do. Its not that I don;t like Google Reader, it's a time issue. I think I have gone through the mad exploration (honeymoon) stage where I signed up for everything, and now have settled down into a boring marriage with a few reliable tools that do what I want in terms of my learning etc. I like to give presentation on the international midwifery day. If I present at 2:00pm PK time would that be ok? IDM 24 hour virtual event: two weeks to go!